So many actors, so little interest. 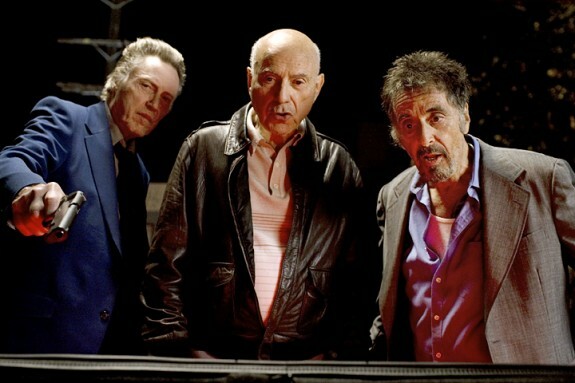 Stand Up Guys follows a day in the life of aging mobsters Val (Al Pacino) and Doc (Christopher Walken), specifically the day after Val’s released from a 28-year stint in prison. Val’s eager to catch up on all the vices he’s been deprived of for the past nigh-30 years while Doc has until 10:00 am the next day to kill him. Add to that the inclusion of their old driver Richard (Alan Arkin), and you pretty much have the movie right there. The idea is that much of the humor comes from the fact that they’re older guys living it up like the old days (which they note roughly several thousand times), but their conversations and adventures are so one-note and cliched that the old days must have been exceedingly dull. For example, the first 20 minutes has Val and Doc hitting up a bar. Val hits on a group of college girls and one of them throws a drink in his face. Fair enough reaction. 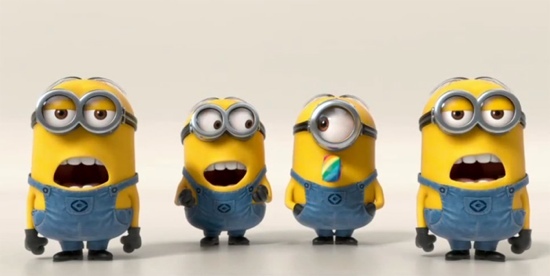 If you like this sort of thing (animated movie sequels, that is) then you will probably be excited to see the latest trailer for Universal’s Despicable Me 2. Universal opens its sequel on July 3, 2013. Steve Carell is back in the lead with Kristen Wiig and Al Pacino joining him in the voice cast. The original was a big hit, grossing $543M worldwide in 2010 and spawning an Orlando theme park ride Despicable Me Minion Mayhem, so you shouldn’t be at all surprised to see a sequel on the way. Check out the latest trailer after the break. A long time coming, the definitive bio-pic of Jack Kevorkian, the controversial physician who made headlines in the late ’90s by performing physician-assisted suicides, is here. You Don’t Know Jack covers the main events from Kevorkian’s tenure as “Dr. Death”: His first assisted suicide, his meeting Geoffrey Fieger, the subsequent trials culminating in Kevorkian’s trial for the death of ALS patient Thomas Youk (in which the doctor, with great difficulty, represented himself), and ends with his incarceration. These scenes and others are obligatory, but the film is less concerned with presenting an argument for assisted suicide or depicting history as it is with understanding Kevorkian the man. As the doctor, Al Pacino holds the film together with one of his more subtle performances in recent memory. Likewise, it’s been a while since Pacino so immersed himself in a role that you forget you’re watching the actor. He plays Kevorkian as a man so convinced of his own view that he often falls into the same sort of dogmatic stubbornness he attacks. When he shows up to a courthouse dressed in colonial garb and encased in a prop stock, one can’t help but think of the scene from The People Versus Larry Flynt when Woody Harrelson similarly goes to trial wearing the American flag as a diaper, both men putting aside the furthering of their cause for petty grudges. But Kevorkian at heart is not first and foremost a showman.